Choose from our comprehensive Foam Rollers range. 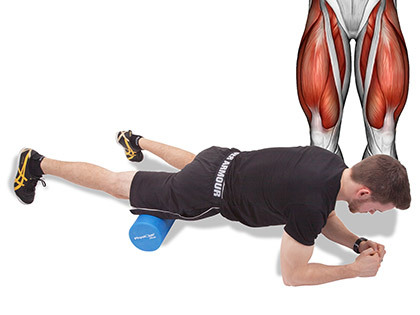 Below is a list of some of the most beneficial foam rolling movements for general muscle maintenance. Each with an example on how to progress or alter the exercise and a list of sports or injuries they're most synonymous with. Please consider the fact that all activities will utilise countless different muscles and the sports that are listed are merely there as an example and are in no way exclusive to that particular roll. The intention is to help you craft a better understanding into the bodies’ mechanical patterns within exercise, giving you the confidence to forge your own self-diagnosis. Target each muscle (or muscle group) for up to two minutes at a time. Begin with long, smooth rolls in the same direction that the muscle attaches. Pause periodically for 10-20 seconds on trigger points or alternatively perform concentrated rolls back and forth over the effected site for the same duration. Breathe deeply and try to relax. Your calf is made up of more muscles than you may think but a good place to find a common trigger point is at the larger fleshy muscle towards the knee called, Gastrocnemius. 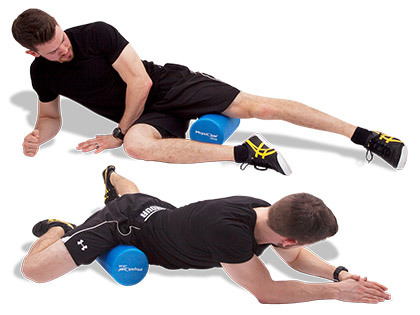 Try starting with long smooth rolls from ankle to Gastroc followed by short repetitive rolls on the trigger points. Sit upright on the floor with the roller positioned under the right calf. The left leg should be bent with foot on the floor for support. Position both hands on the floor behind you and lift the hips off the floor. Slowly roll back and forth along the calf from the ankle to the knee (making sure not to pass over it). Repeat on the other leg. To increase the intensity cross the supporting leg on top of the working leg. Not feeling much? - Experiment by rotating the hip internally and externally to target the surrounding muscles of your lower leg. If you find suspending your weight difficult, place two books or blocks under the palms to help make raising your body a little easier. The thoracic spine (T-spine) is made up of 12 vertebrae, equating to the largest portion of our spine. Releasing the muscles around the T-spine will help to improve thoracic extension, which is paramount for successful weightlifting and combatting poor posture. 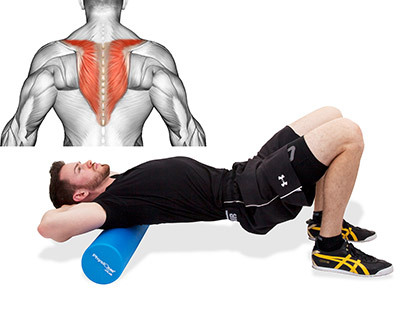 Slowly lie back on the roller until it's positioned width-ways across the upper back. Brace the core and elevate the hips to form a horizontal line to your shoulders. Hands can either be crossed over your chest or behind your head for support. Slowly roll from your shoulder blades to mid back and back up again. Remember to visualise the movement and be aware of any adhesions along the way. This progression requires a fairly good range of movement. 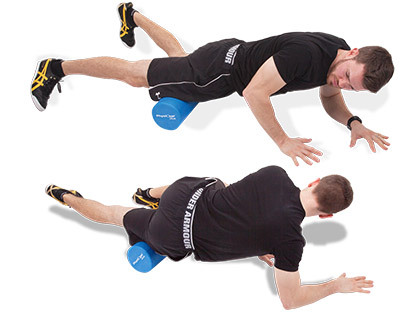 If in doubt, start with either a half roller or ask your trainer or therapist to run you through it. After the initial roll, pause with the roller crossing the lower portion of the shoulder blades and slowly begin to sink your head and hips towards the floor. Pause for sets of 10-20 seconds and breathe deeply. The reason for avoiding the lower (lumbar) spine is due to the fulcrum being too close to your centre, creating a very stressful hold for your core. If you wish to roll the lower back, sit upright instead and place your hands behind you. The position of your arms can help to determine which muscles of the upper-back are targeted. Keeping them behind your head will focus on the trapezius, whereas hugging your arms across the chest may help reach the deeper rhomboids, adjacent to the spine. Anyone who is seated for long periods of time on a daily basis will greatly benefit from this pec release; helping you to free up the shoulders to retract (draw back) the shoulder blades once again. 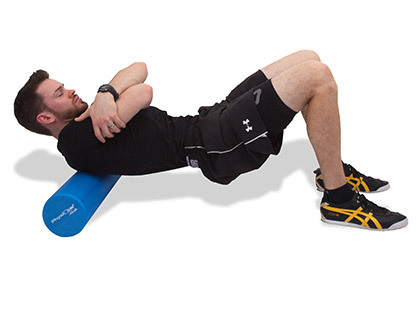 Lie face down with the roller positioned under the right pectoral (near the armpit). Raise the right arm diagonally out to the side at just above head height with arm extended. To adjust for intensity; use your left arm to distribute your weight onto, or away from, the roller. Gently rock back and forth to discover the tightest spot. If you're struggling to hit that hotspot, some people prefer extending their arm directly overhead, rather than out to the side. This is because there are two separate muscles on each side of the sternum: pectoralis minor and pectoralis major. Given their different attachment points, try experimenting with the position of your arm to help determine which muscle is the tightest. Avid weightlifters will also find affinity with this movement. 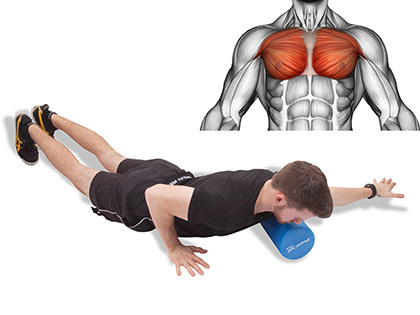 With every bench-press and push-up, we're slowly encouraging our shoulders to round and chest to close. Include this movement on your next "chest day" at the gym and be prepared for a painful (and much needed) release. The quads are hardworking muscles that have the rather repetitive role of extending (straightening) the knee and flexing the hip. If you've never experienced fascial release on your quads before, be prepared for a fresh perspective into pleasure and pain. Lie face down propped on your forearms in a "plank" position with the roller positioned under one thigh just above the knee. With your core braced and hips elevated begin to extend both arms, causing the roller to travel up the thigh towards the hip. Repeat the motion forwards and back for two minutes before changing legs. Considering there are four separate muscles to the quadriceps, rotate your hip internally and externally as you roll to help target all four. Remember to distribute your weight accordingly for your own level of tolerance. The less of your body in contact with the floor, the higher the intensity. Given the hamstrings combined width, I often find that a roller doesn't quite give me the depth that I need. When this is the case, I'll use something with a smaller surface-area like a tennis ball or duo-ball. Sit upright, with one leg extended straight. 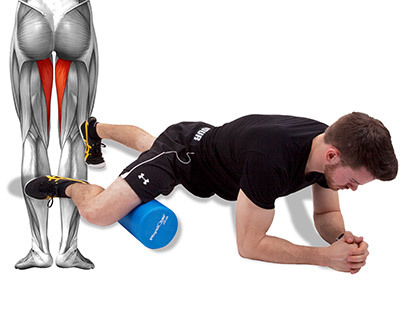 Position the roller high up under the hamstrings so it's just touching the glute. Lift your weight so that only your hands and foot are in contact with the floor and slowly glide back and forth along the thigh; stopping just before the fold in the back of your knee. 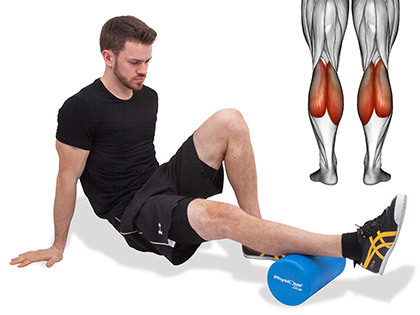 For added intensity, cross your supporting ankle over the thigh, to increase the downward force on the roller. There are three long muscles that make up the hamstrings (and plenty of others alongside them too) so remember to rotate your leg at the hip as you roll to target each one. An often neglected and all too important set of muscles are the adductors. Keeping these muscles healthy can help improve your balance on one leg and more importantly, keep you clear of some hip and groin injuries too. Similar to the quad roll, begin face down in a bent arm plank position but this time raise your right leg to the side, flexed to 90 degrees. 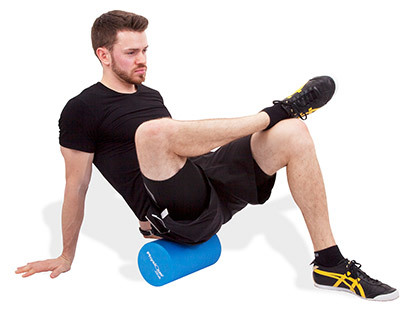 Place the roller under the inner thigh of the flexed leg, near the knee and brace the core. Suspend your weight so that only your left foot and forearms are in contact with the floor, then glide laterally to your right, moving the roller towards and into the groin before returning, slowly, back to the starting position. Repeat for up to two minutes before changing legs. If you find this position to be too intense, you can instead; lie on your side with top leg extended and place a roller under the inner thigh as pictured. This will provide far less bodyweight over the roller. Stick to this position for a week or two before returning to the 'plank' hold. Inversely, if the original movement is not sufficient, perhaps reassess your position on the roller. 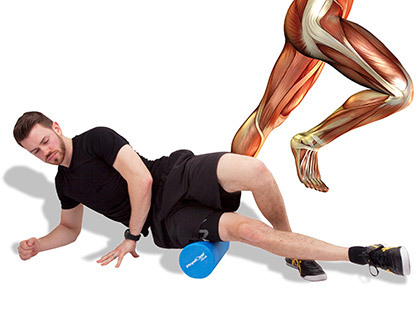 Try turning your body into the roller as you roll to apply more pressure to the muscles. There are many muscles that adduct (draw towards) the hips, all of which vary in length; so ensure you roll the entirety of your inner thigh, from knee to groin, to help release them all. 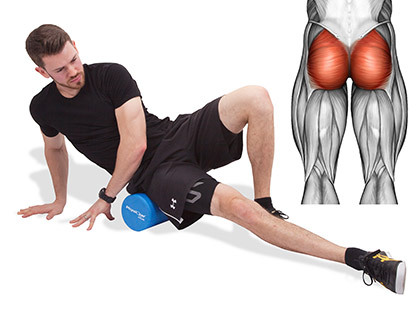 The ITB is a strong piece of connective tissue that runs from the hip to the knee and is arguably the most sensitive body part to roll. Its job, as a very important knee stabiliser, means that if overlooked, can lead to specific hip and knee injuries. 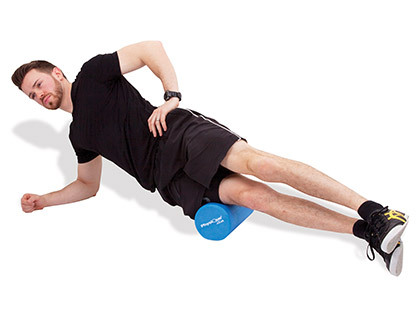 Lie on your side with the roller positioned underneath the outer-thigh, near the knee. Place your other foot on the floor for support and keep your upper body propped up by your arm, straight or flexed at the elbow. Using the shoulder for movement, glide up and down along the roller, making sure to cover the entirety of the ITB, from knee to hip. Breathe deeply and try to let go of the tension. 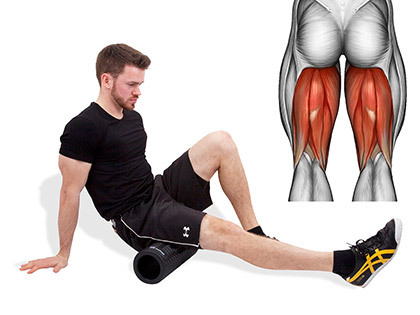 For the veteran foam rollers out there; stack both legs one on top of the other for maximum intensity. Due to the acuteness of the roll, two to three minutes on the ITB will feel like a lifetime. Aim for just 45-60 seconds to begin with and gradually increase the duration over time. This is one of the few times where having a worn out old roller may just be a blessing. Try not to be too concerned with your hand and foot positions. 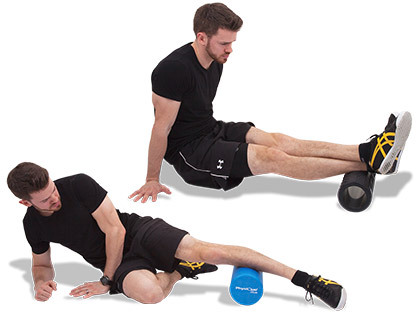 As long as the roller is targeting the outer-thigh, adopt the most comfortable stance you can. The gluteals (or glutes, for short) consist of three separate muscles, which attach around the hip and pelvis. The largest of them, gluteus maximus, is also in fact the largest muscle in the human body, supplying us with the power we need to jump high, lift heavy and run fast. Sit upright with one leg out straight and hands on the floor behind you. Position the roller under the glute of the straight leg and drop your hip laterally to the side. 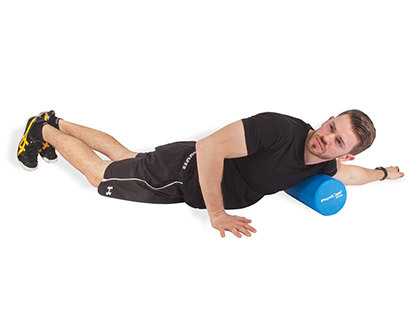 Perform the roll in separated sections, to help isolate the glutes individually. Start at the very top of the hip near the lower back and work your way down, slowly (back and forth) towards the hamstrings. It's possible to adjust the length and exposure of the glutes (and other hip rotators) whilst rolling, by crossing the legs. This altered position may move a previously obstructed muscle into focus. So now is a good time to remind you to be present and visualise the movement when you roll. The greater your awareness, the greater the benefit. You'll find yourself repeatedly adjusting your hand placement and upper body position - and you should, that's a good thing. Get in the habit of being dynamic when you roll, as this will encourage presence of mind and reactive mobility. Given the glutes' intricate involvement with hip mobilisation, it's definitely worth dedicating some time to their release. I find it to be one of the most directly rewarding muscle groups to work on. After all, you wouldn't want to hinder their potential power gains and athletic qualities. Shin pain is a common complaint among long distance runners and anyone who's recently changed their running duration. The tibialis anterior sits laterally to the shin bone (tibia) and doesn't have an awful lot of space to expand when inflamed. 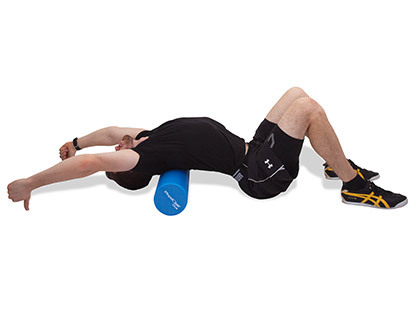 This means it will respond very well to regular release on a foam roller. From hands and knees, position the roller under both ankles, suspend the knees and brace the core. Roll towards the knees by extending the legs, before returning to the starting position and repeating. After a half-dozen rolls or so you may need to readjust your hand placement as the roller tends to work its way south. Bear in mind, the tibialis anterior runs down the outside of the shin bone. For more pressure, shift your weight from one side to the other to direct weight onto the muscle and away from the bone. For a satisfying quad stretch, place both hands behind you and gently lower your weight back onto the heels as pictured.